What’s that stuff in the water? 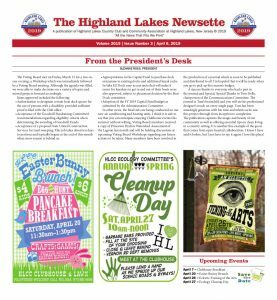 Highland Lakes – Check Us Out! The Lakeside Café has long provided live music—open mics performances and professional acts—in the Lake Room at the Clubhouse. Our open mic format has been held on the third Saturday of every month since October of 1997. Members (and their guests) have an open invitation to perform in our open mic format or just enjoy the live some music. You never know what or who you’ll hear each month, but all levels of talent and all different types of music are welcome and expected. Café Specials are typically held on Friday or Saturday nights. Tickets are priced to cover the expense of the show. Past performers have included Karen Savoka, The Nields, Cliff Eberhart, Don Ross, Slaid Cleaves, Lucy Kaplansky, and The Kennedys, not to mention a jazz brunch and an evening with jazz guitarist Bucky Pizzarelli. • Sign ups start at 7 pm the night of the show, but sign ups do not dictate the order of appearance. • Each performer or act can play 3-4 songs per act. • Performers are asked to control and moderate their volume according to the room’s size and the number of people in it. • Audience members are requested keep their conversation to a minimum during each act. • Coffee and tea are provided… but you’re encouraged to bring something for the “community coffee table” and snacks for your table. To request more information or to subscribe to our mailing list, contact George Slater by sending an email to Highland Lakes at hlcc@warwick.net. 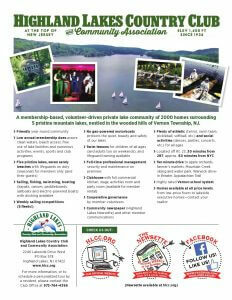 Highland Lakes - Check Us Out! 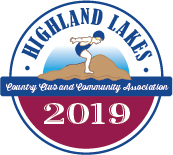 Copyright © 2011-2019 Highland Lakes County Club and Community Association. All rights reserved. Unless otherwise indicated, all materials on these pages are copyrighted by Highland Lakes Country Club and Community Association. No part of these pages may be used for any other reason than personal use. Therefore, reproduction, modification, storage in a retrieval system or retransmission, in any form or by any means, electronic, mechanical or otherwise, for reasons other than personal use, is strictly prohibited without prior written permission. Powered by Wordpress. Theme design by Handla Online. Site design by HLCC Communications Committee.